The 26 metre motor yacht Boomshakalaka, listed for sale by Pierre Badin at G-Yachts, has had a price reduction of €300,000. Built in GRP by Italian yard Arcadia Yachts to a design by Francesco Guida, Boomshakalaka was delivered in 2017 as an Arcadia 85 model and is still under yard warranty. Accommodation is for eight guests in four cabins configured as a full beam master suite, VIP suite and two twins. All guest cabins have entertainment centres and en suite bathroom facilities while a further two cabins sleep four crew aboard this yacht for sale. The semi-planing Arcadia 85 motor yacht carries 40 square metres of photovoltaic panels each composed of hundreds of high-performance solar cells, which power all of the yacht's on board equipment and its hotel load, including the showers, refrigerator and lights. 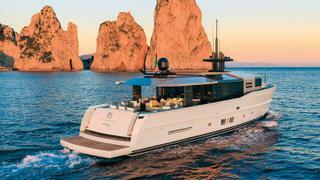 This hints at Arcadia's passion for green technology, as does the optional hybrid electric powered propulsion. The yacht boasts a seven metre beam, wide for her size, which allows for spacious accommodations. She is designed with a focus on indoor/outdoor living, and the deckhouse is made almost entirely of double-layered reflective glass, letting in ample natural light. Sliding overhead blinds give privacy and shade when desired. Twin 730hp MAN diesel engines power her to a cruising speed of 14 knots topping out at 18 knots and she is fitted with ABT zero speed stabilisers. Lying in the South of France, Boomshakalaka is now asking €4,650,000 with VAT paid.